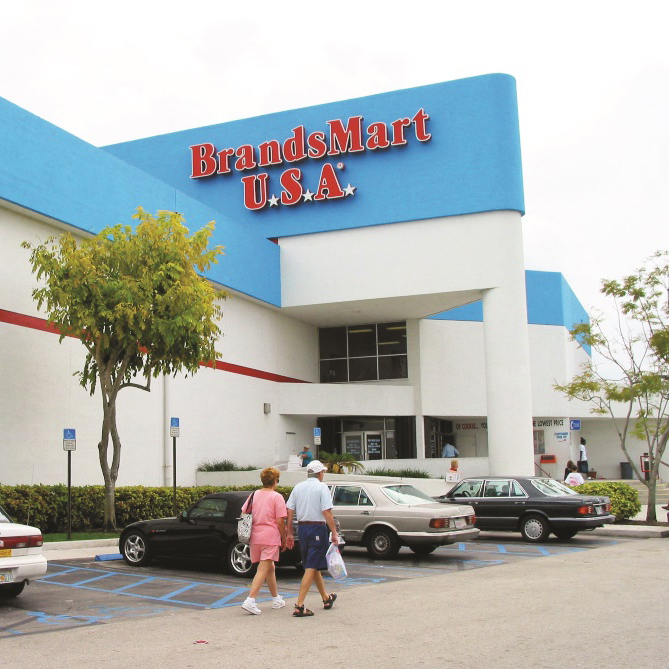 Brandsmartusa is a privately held company that has 11 stores in the Florida and Atlanta, Georgia area. It is a leading discount retailer for consumer electronics and home appliances. In 2007 revenues were estimated at US 1.3 billion and employees currently number over 2600 in Florida and Georgia. If you have a problem with a product from Brandsmartusa you may call 1-800-432-8579. You may also email a message. For a full list of the phone numbers, addresses and hours for all 11 stores check here. If you would like to send postal correspondence to the CEO, Michael Perlman you may address your letter to him with Box: IVT32, 3200 SW 42nd Street, Hollywood, FL 33312. Corporate numbers are 954-797-4000 and fax 954-797-4047. Brandsmart was started by Robert Perlman and has a 110% price guarantee. The unique octagonal showroom design gives shoppers more efficiency in viewing all products in stock. Social presence is found on Facebook, Twitter, YouTube and Pinterest. I am beyond pissed off first it takes 2 months to get someone to come look at my TV to fix took 3 weeks for a orderd part to come in just to find out it was the wrong part and they have to order another....I'm pissed and bringing the tv back and I never want to buy anything from again . I am truly overwhelmed and fatigued with trying to rectify this situation. I purchased a television yesterday with the hopes of upgrading my current television. The television purchased did not provide screws to mount the television, so to get the correct size screws, I read the manual. All four screws went in but one socket was loose. I discovered, the socket was broken. According to Roy Luciano and a few others, the television is damaged and it was not sold in that condition. O was told over and over again, that I broke the television. I explained to Roy, there is truly no indication that the television wasn’t faulty. After a few no’s, I asked what about the warranties and his ability to accept the television. Roy responded by saying, “I can accept the television, but I will not in this case.” Roy then brought in a gentleman from installation to tell me, the television was damaged, it was my fault and there was nothing they could do. I was informed by an employee that televisions are accepted in worst conditions then this and truly this television isn’t damage. The employee then commented, you can see it was damaged inside. I was made mockery of by at least several managers and coworkers that passed the word amongst each other. I was told by Roy L. I do have the discretion but I will not use it in this situation. I was told, by Roy L. and the installation gentlemen to hang it with the 3 inserts instead of the required 4. I was told Ed A. was the GM but he never once came to personally speak with me. I was told he gave his no from behind the scenes. I pray I can be helped or at least feel like a valued customer. My husband and I spent 2 hours making sure all the appliances I needed for an entire kitchen and a washer and dryer to be delivered within a certain time frame only to find out that my items were not available and would not meet my deadline at all. Spent an additional 2 hours calling to speak with a manager only to have them offer a refund instead. No resolution in site. Very disgusting customer service after spending $4,000. I am very disappointed in the treatment that I received from your delivery driver all the way to the customer service number to your store in Jonesboro GA. I ordered a washer and dryer set off line. Horrible experience and I will not ever buy or shop your stores again. My name is Peter Dawkins and On December 2nd 2018 I purchased a refrigerator from your company( The stockbridge location) and was told that delivery was not available until one week later which was on December 9th 2018 . I agreed to the purchase and paid for the delivery fee which was $39 . On Sunday December 9th I did not receive a call from anyone regarding the delivery of the refrigerator so i decided to call the customer service desk to find out when and what time my fridge would arrive. After waiting about 30 min a customer service clerk told me the salesman was busy and she would call me back. I waited another 30 min and she did call back and said the salesman told her he thought I was coming to pick up the fridge . I requested to speak to the manager and after waiting 30 min he told me he was not sure why the salesman said this and he could not deliver the fridge until December the 12th which would mean I would have to take a another day off to accommodate the delivery.I am writing this letter to inform you that this is unacceptable and your company should respect and honor your promises. I would also like to be compensated for the time i will have to take off because of this mis management. 2. Made several phone calls to customer service and told it would definitely be delivered. 3. No appoligy from anyone. Cancelled dinner plans awaiting delivery. 4. Told I would have to wait until 12/3 for another delivery. Bought this now from Lowes. Horrible experience with returning an item on warranty thru warrentek and brandsmart personnel.i have an active return number given to me thru warrentek.went to store to validate the number given and seems that brandsmart cannot find the order number for my return.however this should have been in the system for 2 weeks now.i was treated unfair and felt that i was in the middle of some type of fued between warrentek and brandsmart manager and personnel. That is when i realized that workers at this store treat people with complete ignorance and disrespect and on top of really not helping the customer out during a return.Because of incidents that occurred i will no longer shop your brand nor reccomend to anyone and i will share my story. 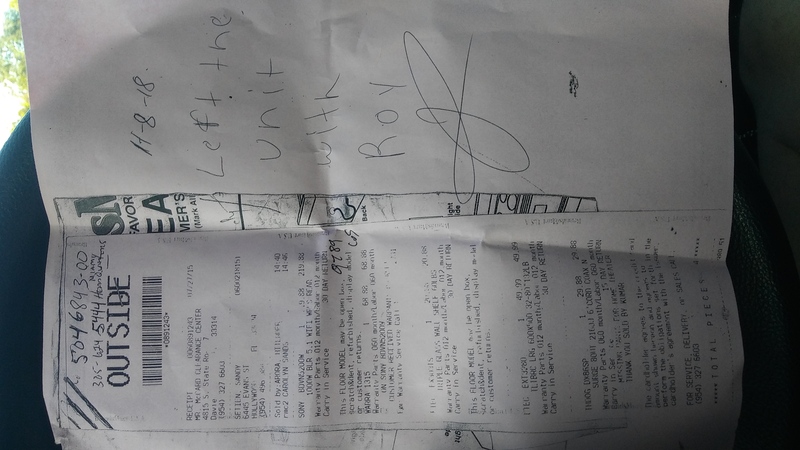 So today my unit was taken in by customer service.i was given a blank sheet of paper that said "left unit with roy".and copied my reciept on a blank paper and that was that.i asked when it will be ready he reply. I have no idea. WOW....... What an experience .below is a copy of what was given to me.my own reciept copied on blank paper. Oh and by the way i had to tell him to please write my number down . please help very dissatisfied customer.i have spent thousands of dollars at brandsmart as a customer.dont want to part ways but think i might. Ps hope this gets to the right person as i work hard for a living a pay for what you want in life this is a big world and sometimes the little guy isn't heard at all.if there is anything i can do as an inhabitant of this earth to make things better i will. Sincerely sandy setien. I'm very upset with brandsmart USA in 2015 I bought a washer it last only a year when I call them I was told they can not locate my purchase 400 dollars when to waist SAD.now I bought a samsung refrigerator4 months ago the handle broke twice already the customer service rep very rude, it's sad they don't want to help you after you make a purchase. NEVER AGAIN. PEOPLE NEED TO STOP SHOPPING THERE. VERY TRASHY SERVICE. NEXT TIME I WILL TAKE MY MONEY SOMEWHERE THEY VALUED ME. I received an email about previously viewed item being on sale and that I could have 12 months finance with no interest. I contacted the Synchrony Bank for the credit card who confirmed that it will be 12 months on purchases over $600. So I contacted BrandsMart USA sales department for the appliances and asked if I purchased a refrigerator in a dishwasher will be haul off the other items that I already have. Also wanted to know if I can have insurance on the refrigerator if it was not installed in my house if it was going to be in the garage. The lady told me that they will hold off the other items at no charge and that yes I can have the insurance and I said okay. I let her know that I was just going to go ahead and make my purchase on line now that she confirmed the information she told me that I needed to come into the store because there were better deals. I got someone to take me over to the store which is an hour away from my home I got to the store and I looked at the products the prices were actually more than what it was online. So I let her know that it cost him more and that I would just go home and purchase it online. I showed her the price online if I added it to my car and she said that she will go ahead and honor that price and sell me the items that I don’t end up still costing almost $200 more in a store versus what I was paying online. She told me because of the drive over in all the inconvenience that she was going to waive the shipping charge on the phone she said the shipping was $35 in the store it was 40. Ultimately they charge me the shipping because I wanted to 12 months interest which the email said I will receive. The refrigerator in the room having a rebate in between her in her manager it took over 40 minutes for them to figure out how to get me the rebate information I had already advise I was ready to leave several times she just kept asking me to stay give her a few more minutes I ended up being in store for 2 1/2 hours and I complaint before I left the store to customer service in the store she told me to go online and file the complaint. Also I was downstairs trying to buy other items it was a guy downstairs kitchen department stated he was from the cash department and he knew nothing and could not help me and could not call anyone to come help me with my purchases. I have medical accommodations for driving as well as for work and I found this to be a real big Inc. of me is because of the 2 Hour Dr. one dare one bag as well as the 2 1/2 hours been in the store that’s 5 1/2 hours that I used out of my day to get horrible service when I was trying to make my purchase online and she told her manager that she wanted me to come in the store so that she can get credit for the sale that was the only reason. Almost 2 years ago my refrigerator didn't work. They told me it needs a new compressor. I paid over 800 dollar and still it didn't work. Then they told me i have to buy a new refrigerator. And i am out of my money i paid. I would like you to refund my money if not please send me your agent address so i can file a small claim court. Went to clearance center in Davie FL had the worse experience I've ever had. I usually go to Deerfield Brandsmart, it's not great there but compared to this place it's heaven. The cashiers are rude, we got stuck with a new guy he messed up the checks no one would help him. Then one sales employee Rebecca pretended to help him just to get the computer he was on. Cashiers but in and lie sticking up for Rebecca told that I got eyes and ears. This is all about herself. I asked for a manager 3 times never saw one. I bought a 65 inch Sony TV that costed more than $2000 last year and the salesman convinced me to buy a 5 years full warranty, and it stopped working on August 15, 2015. I called to place a repair order. It has been 40 days and I don't know when I'll get my TV fixed. I keep calling the electronics lab and the warranty department in Brandsmart, and I didn't get any help. They just kept telling me to wait, and I tried talking to the manager there but they said there's no manager there. Can anyone give me some idea of when my TV will be fixed? I have been a Brandsmart customer for more than 20 years. It's very disappointing and unacceptable. I wouldn't even give them 1 star for treating a loyal customer like this. I hope someone can solve this problem. My repair order number is 783015600. Thank you. Bought a TV from Brandsmart outside of Lawrenceville, GA. 8-26-13. Also purchased a 3 year service agreement. Have been trying for almost 3 weeks to get some help from Brandsmart. Repairman from Atlanta Professional Electronics picked up TV and reported back it was not repairable. Haven' heard a work from store in Doraville, GA. Went to store and spoke to MGR but she was no help. Sales Invoice no 1330511. Date purchase 8- 26- 13. The TV was BS TV ETC? We were looking for a complete Kitchen Appliance package on finance. Brandsmart was the right choice where we got a great deal and able to pay it off within 24 months. The staff out there were very helpful and give various options to choose from. I am happy to be a customer of Brandsmart as they have the best in class products. I have referred this to many of my friends and family members who are looking out for home needs on finance assistance. I have planned to go in for other products too during this year end and Brandsmart is definitely the choice.